As in many other aspects of the global economy, corporations continue to exert inordinate influence over aspects of trade agreements that control life and death, and the rule of democracy particularly in low and middle-income countries. Corporations are able to disproportionately influence provisions of trade agreements to a far greater extent than public health, labor, other citizen representatives, and low-income countries. Corporations are allowed greater access to the trade agreement development process. For example, in the U.S. the memberships of the advisory committees to the Office of the U.S. Trade Representative are overwhelming dominated by industry with very few representatives of public health, despite federal law that requires diversity on such government committees. With the introduction of each Free Trade Agreement, public health advocates, some members of Congress, and representatives of low income countries continue their struggle to bring equity and fairness to issues around health issues, including access to medicines. Trade agreements through the World Trade Organization allowed pharmaceutical corporations intellectual property rights that enabled them to maintain long-term control of patents and drug prices and restricted competition from generic manufacturers. While there were some possibilities for countries to address public health emergency conditions (e.g., through compulsory licenses), pharmaceutical corporations have used numerous tactics to try to thwart those openings. As a result drug prices are higher than many low-income countries—where diseases such as HIV/AIDS tuberculosis and malaria are rampant—can afford. The trade agreements restrict use of existing research to develop generic, lower-cost medications, and tie patenting to drug registration, both of which prevent expeditious delivery of low-cost medications. Poor countries simply cannot afford the costs that pharmaceutical corporations charge in higher income countries, in support of the corporations’ large profits. The trend in recent years toward bilateral or multilateral agreements directly between countries shows that not only are the WTO restrictions continuing, but that the new agreements are including provisions that place even greater limitations on giving access to medications, and decrease the ability of the country’s public health agencies to develop and implement health regulations. Corporations lobby for inclusion of provisions in trade agreements that allow them to circumvent low- and middle-income countries’ restrictions on tobacco, making them prime targets for the marketing of tobacco. The Trans-Pacific Trade Agreement (TPPA) being negotiated now between the U.S., Australia, Brunei, New Zealand, Singapore, Vietnam, Chile, and Peru, and the trade agreements between the U.S. and South Korea, Panama, and Colombia that were recently passed by Congress, raise concerns not only about health issues, but also labor rights and jobs. Of additional concern about the TPPA is the secrecy with which negotiations are being conducted. Several health professional organizations, including the American Medical Association, American Academy of Pediatrics, the American College of Preventive Medicine and the American Medical Student Association sent letters to the US Trade Representative expressing their concerns about the tobacco and alcohol provisions of the TPPA. Low- and middle-income countries continue to advocate for provisions in trade agreements that recognize their sovereignty and enable them to protect the health of their people. For example, in September 5, 2011 the Malaysian Government declared its opposition to any components of the TPPA that adversely affect access to medicines. The declaration included opposition to the same features that low- and middle-income countries, public health professionals, and health advocates have opposed for many years across the development of many trade agreements. Aspects of trade agreements that they oppose include: data exclusivity that prevents use of clinical trial data to register generic medicines (even after patent expiration), extension of patents beyond 20 years, extension of patents for minor, insignificant changes to a drug, seizure of generic medicines by customs agencies, linking patents to drug registration that prevents registration of generic medicines, assumption of patent validity in courts, and suits by corporations against governments applying their own regulations and encouraging internal manufacturing. William H. Wiist is a Professor in the Department of Health Sciences at Northern Arizona University, and is a Senior Scientist in the Interdisciplinary Health Policy Institute. He is also a Clinical Professor of Public Health Practice at the University of Massachusetts, Amherst. 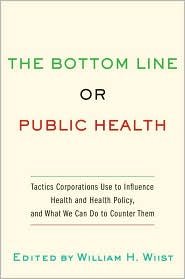 Wiist is editor of The Bottom Line or Public Health: Tactics Corporations Use to Influence Health and Health Policy, and What We Can Do to Counter Them.